2100 square foot spacious waterfront lagoon property. One of closest lagoons to the bay, just 5 minutes and you are cruising in the bay. Large living room with great light. Open space kitchen with large table that seats up to 10. Additional second living area space upstairs if you desire a quiet retreat. This house has 5 bedrooms. (A large master bedroom is on first floor and with 4 large bedrooms upstairs.) Downstairs has full bathroom that is handicap accessible. Upstairs has 1 full bath with tub/shower and ½ bathroom. 50’ of Great Dock area with a Wave runner floating dock, and room for 2 boats. You can go boating, crabbing, swimming and kayaking off the dock into this dead end lagoon. Over 900 square foot of spectacular outdoor decks accessible with sliding glass doors from first and second floors which are great for entertaining and enjoying beautiful sunsets and views of Atlantic City. Grill provided and parking for 5 cars. Large Outdoor Shower. Just 5 minutes from the Long Beach Island beaches. Ideal place to share with 1 or 2 families. Sleeps 12. Ceiling fans in every room. Central Air. Minimum rental age limit is 25 years old. No prom groups. Owner David Hodulik requests that anyone interested in renting call so questions about the property can be answered. Have been managing vacation properties for our family for 4 years now. Love VRBO. 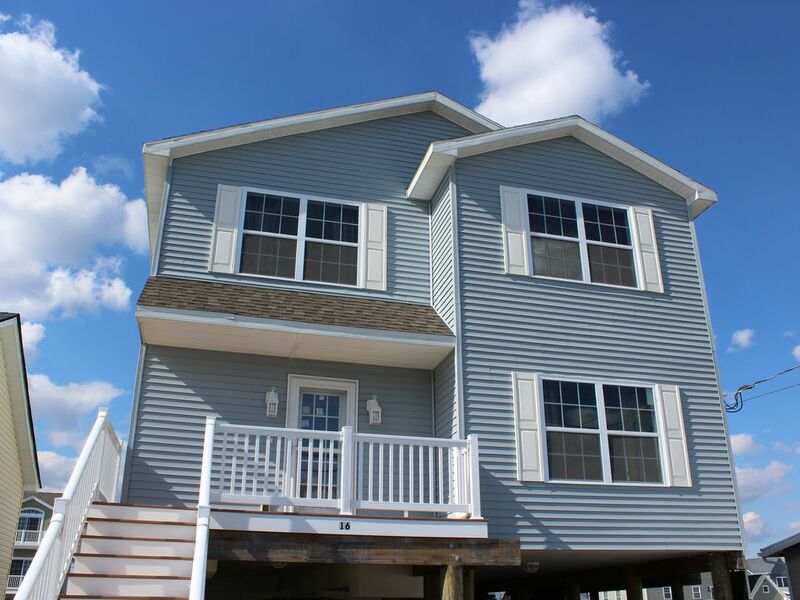 Our other properties are on LBI in Ship Bottom NJ. This home was built after Super Storm Sandy damaged the original small bungalow. This 2100 SF home is a vacation gem, with a wonderful lagoon, and is just minutes from the beach. Our home was beautiful....so relaxing and family friendly....David was wonderful with all my questions and so accommodating. I definitely would recommend and use you folks again! You made our family trip to attend s wedding the very best!! The location was good and the property is spacious. The owner was helpful and courteous. The furnishings, bedding, and a few appliances, primarily the microwave, appeared quite old and needed upgrading. It would also have been preferable for the bedroom curtains to have more of a black out effect to keep night lights from outside to a minimum. This hous was perfect for our family Christmas stay. 10 adults and 2 children and we had plenty of space. The neighbors are super friendly. The owner David is amazing. My family and I will definitely be back! Great house with open floor plan!! This house was perfect for our Thanksgiving stay! 8 adults and 4 kids with plenty of space for everyone. The kids loved the upstairs game area! I definitely recommend this property. Owners were very responsive through the whole process. We are hoping to go back in the summer sometime to be able to enjoy all the amazing outdoor features! What a wonderful house on the canals of Manahawkin. I would highly recommend it! We rented the house for a group of our family - in town for a wedding. It was the perfect place to gather. Enough bedrooms for all. Only wish we were here in summer to enjoy the decks and water. Thanks for a nice visit.